Industry 4.0 or IR 4.0 has been much touted of late by both public and private entities, not only in Malaysia but on a global scale. The aim of IR 4.0 is to create ‘smart factories’ that utilise computers to optimise industrial production that can achieve results in an efficient manner, with the introduction of design structures from the Internet of Things (IoT) into production networks. In doing so, many sectors are progressing into an automated state that was not possible 10 years ago, with the integration of Big Data into their technology. But these technological advances also mean heavier responsibilities as IT-related threats and security risks are able to cause unexpected loss and damage to the same companies seeking to use them. Students, in particular, need to upskill for IR 4.0, as it also means the birth of new careers and new ways of getting things done. In spite being digital natives, students need to develop digital literacy skills which are crucial in order to build their personal brand and enter into fulfilling careers. Upon graduation, they will also need to demonstrate flexible thinking skills and adaptability to a rapidly changing working environment, so that they can adjust to rapid changes and address issues that may arise from any technological abruption. These was the sentiments echoed by Professor Jaydip Sen from Trans Neuron Technologies, Bangalore, India, a company specialising in products and programmes for IR 4.0 skills. With 25 years of experience in the field of communication networks protocol design, network analysis, cryptography, network security and analytics, Professor Jaydip has worked in reputable organisations like Oracle India Pvt. Ltd., Tata Consultancy Services Ltd., the National Institute of Science and Technology, India and the Calcutta Business School. 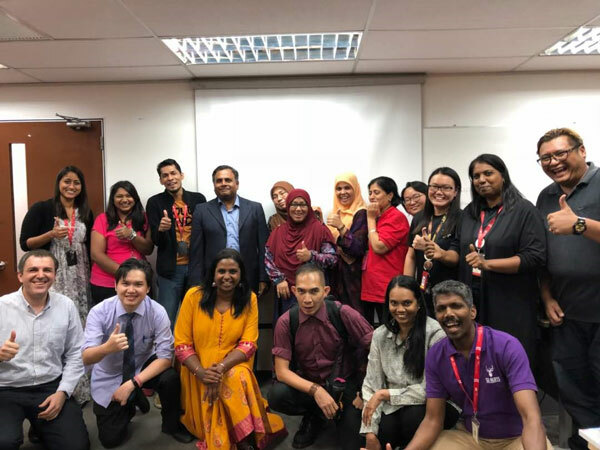 He was recently invited to conduct a Business Analytics workshop for academicians at INTI International University, Nilai. With Data Scientist being listed in TalentCorp Malaysia’s 2017/2018 Critical Occupations List , Professor Jaydip said the global demand for such occupations double every two months, as data analytics covers a broad range of fields, including social media and business. Data scientists also ‘train’ machines to predict future trends such as the stock market and customer behaviour, as machines can learn from the past through the power of data. As such, data analytics cover all functional areas of businesses and companies can make good business decisions when they enlist data scientists. “Business and engineering students can also learn data analytics and become experts in the field, the opportunities are not just limited to IT students,” he advised. However, he advises that IT and Computer Science students should engage in an in-depth study in cybersecurity as it is now more important than ever, especially in the wake of cyberattacks such as 2017’s Wannacry global outbreak. As businesses increasingly depend on cloud services, wireless network and digital data, there is a higher likelihood of attacks on these systems. “It is almost impossible to design and implement a perfectly secure IT system, so whenever a loophole is discovered, people will use the loophole to attack that system. Nothing is 100% secure in the digital world as hackers are experts who spend a lot of time in their mission, but effective cybersecurity can help minimise attacks and losses by making it more difficult for such attacks to occur,” Prof Jaydip shared. He further explained that every IT attack the world experiences actually helps enhance network and system securities as the aftermath results in addressing current loopholes.